Tim Tebow is a famous Athlete from USA, he is 31 years old and still alive, born August 14, 1987. 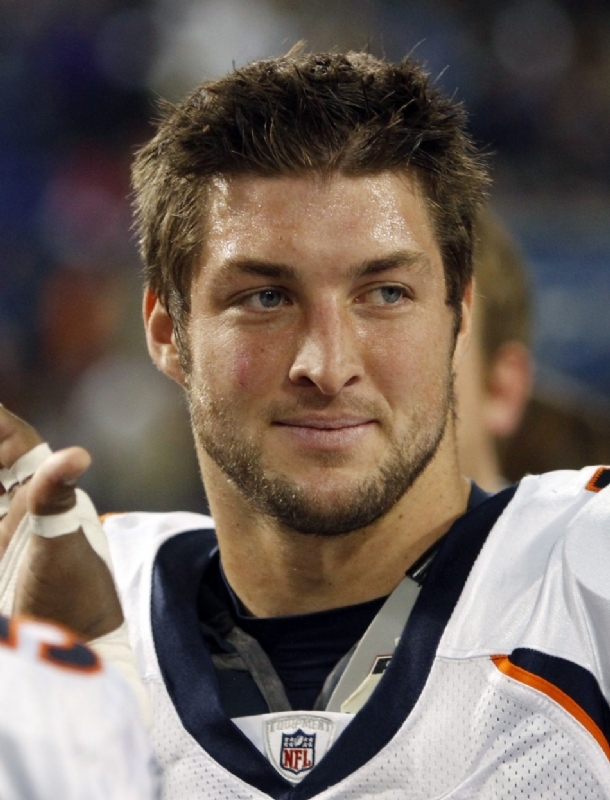 Timothy Richard "Tim" Tebow (born in Makati City, Philippines) is an American footballer who plays quarterback for the New York Jets in the National Football League. He was draftet the Broncos as 25ende overall pick in 2010 NFL Draft. He played college football at Florida University. He is born under the zodiac leo, who is known for Ruling, Warmth, Generosity, Faithful, Initiative. Our collection contains 17 quotes who is written / told by Tim. "On the field I'm trying to play for the glory of God but then also I'm trying to give everything I have and win and compete. And so I think more than just winning or losing, I think He cares about where our hearts are when we're playing"
"If you're married, and you have a wife, and you really love your wife, is it good enough to only say to your wife 'I love her' the day you get married? Or should you tell her every single day when you wake up and every opportunity? And that's how I feel about my relationship with Jesus Christ is that it is the most important thing in my life"
"I am not better than anyone else just because I play football"
"You know, I think He honestly does care about how we play on the field, more than anything more than win or lose our hearts on the field"
"And so I look at it as a relationship that I have with him that I want to give him the honor and glory anytime I have the opportunity. And then right after I give him the honor and glory, I always try to give my teammates the honor and glory. And that's how it works because Christ comes first in my life, and then my family, and then my teammates"
"I will continue to work as hard as I can to make this organization proud. Every time I step on the field I will give everything I have and I will leave everything I have on the field every single Sunday"
"I don't try to focus on anything that doesn't affect me personally and how I go out there every single day. I'm just going to continue to work hard and focus on what I can control"
"To be able to influence someone or to be able to have a group of guys come together to have a successful team and to be together all the time every day for, you know, a year and longer together, you have to have a - find a common ground. And that common ground for us is football"
"I guess, first and foremost, I'd like to thank my Lord and Savior, Jesus Christ"
"I grabbed my mom and I went to the couch and I said, 'Mom I want to ask Jesus to come into my heart.' And I got on my knee and I asked Jesus to come into my heart, forgive me of my sins, and make me a child of God"
"But - but the greatest way to witness is by walking that straight and narrow and also realizing that you're going to mess up. That's what grace is for. We're going to fall, but we've got to get back up. And you've got to improve. And that's what I'm all about"
"So much of how we act and what we do is based on humility or pride - that's everything. And when you can humble yourself, you know, we are more like Christ when we can humble ourselves"
"I have so many things to work on, and so many ways that I fail. But that's what grace is all about. and I constantly wake up every morning trying to get better, trying to improve, trying to walk closer to God"
"You just try to be nice to everybody and treat them all the same. Treat them how you would want to be treated"
"We have to humble ourselves and the way you do that is by serving other people"
"And that's the great thing about living the Christian life and trying to live by faith, is you're trying to get better every day. You're trying to improve"
"It was huge to read the Proverbs of the day every morning, it was huge to read the Psalm of the day every morning and to get that in us and get us going before the day even started"